When you talk about Green Building, many manufacturers, builders, architects, engineers & designers have many different ideas as to what that really means. Going green can mean anything from recycling your soda cans to reducing your carbon foot print on the world's dwindling resources. What we truly need is sustainable construction practices that will reduce the amount of outside resources needed to build and operate your living environment. The U.S. Green Building Council (USGBC) has developed a standardized way of evaluating & certifying your new home to see how really green it is. This program is called LEED-H (Leadership in Energy & Environmental Design for Homes). 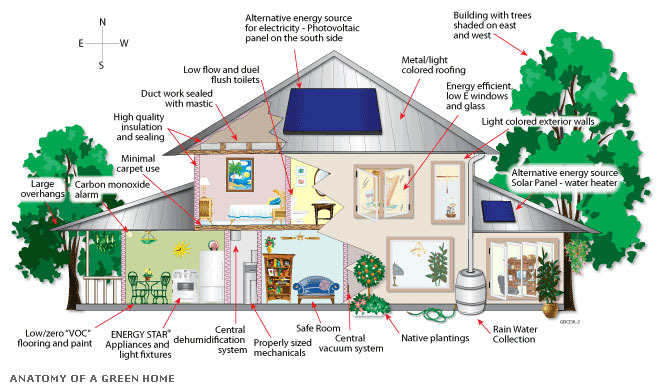 It was developed to encourage the construction of energy and resource efficient buildings that are healthy to live in. LEED-H now grades on a 136-Point Scale. Points are offered in eight categories for adopting specific building practices and for using certain materials or products. All homes in the program must adopt 18 mandatory measures. In addition, 16 points must be achieved to meet minimum requirements in four of the categories. Architects, Designers or Builders are free to choose how they want to acquire additional points depending on variables such as site, climate, house design and budget. Below is a breakdown of the LEED Categories, the number of points available in each category and the goals of each category. Integrate knowledge of all the trades in the design process, plan to make the most durable house possible, and orient the house for solar design. Choose a socially and environmentally responsible site. Minimize the impact of construction and the house on the site. Conserve water indoors and outdoors. 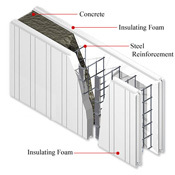 Build a well-insulated and tight building envelope with efficient heating and cooling systems. Reduce material waste during construction, and use green products. Use appliances, installation methods, and ventilation measures to improve indoor-air quality. Compile a homeowner's manual covering the operation and maintenance of the house. LEED rating of certified, silver, gold or platinum based on the number of points a house accumulates in the 136-point system. The point total for each grade listed here is for an average size house. The point threshold in each rating category is lowered for smaller-than-average houses and raised for larger-than-average houses. � 2003-2008 Weldon & Associates, Inc. All Rights Reserved.